"The Unofficial Guide to Medicine is a unique student publishing group, producing high quality medical textbooks written and reviewed by students/junior doctors and checked for accuracy by experts. The series follows a peer-led publishing model that has been written about in Res Medical: Journal of the Royal Medical Society, and has won awards from distinguished organisations like the BMA, the British Institute of Radiology and the Association for the Study of Medical Education. We have a Facebook group of over 26,000 students who provide feedback at every stage of a book’s development, ensuring all of our products are perfectly focused to student needs. The books are now sold in over 55 countries worldwide, and additionally over £8500 has been raised for worthwhile charitable causes, including many run by student volunteers." Scrubs are delighted to be working in partnership with The Unofficial Guide to Medicine sell great quality textbooks at a discounted price to all our members! Would you like reinforcement of key clinical signs/tests you are expected to know, with high quality images including real patients with real signs? And do you want to know exactly how to present your findings back to the examiner, and answer the questions they fire back at you? 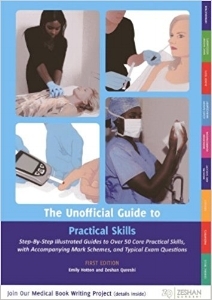 written directly in line with The Unofficial Guide to OSCEs, this is designed to help students practically go through a mock OSCE, either with patients in hospital or with friends at home. Radiology is an important part of clinical work for all doctors, whether it be understanding which type of imaging would be most useful, knowing how best to request the study or interpreting the images. There is a need for medical students and junior doctors to be more than just competent clinical practitioners to get the job they deserve. Speciality training posts are very competitive, and the reality is that your CV needs research, audit, and teaching to make you stand out. There are detailed explanations of over 50 practical skills stations. Each station includes a corresponding mark scheme, associated questions and answers as well as further areas to explore.